Spirit Airlines is offering several ways for loyalty program members to earn miles and save money this summer and beyond. Spirit customers know that the airline features low fares for bare-bones flights. What the carrier might lack in comfort is more than made up for with rock-bottom prices. Cashing in Spirit miles for tickets is a way to make the airline’s already cheap flights free. 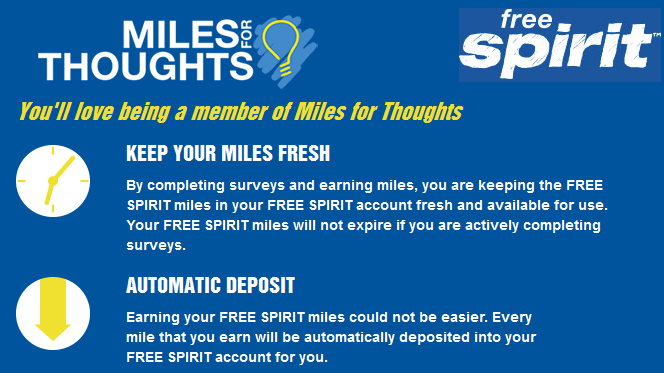 So if you’re interested in earning miles and saving some cash, read on for Spirit’s current offers. Whether you want to rent a car, book a hotel stay, take a survey or goof off online, there’s something here for you. Swagbucks.com lets users earn Swag Bucks for online activities, including shopping, surfing the Web, answering surveys, watching videos and playing games. It is offering 250 Spirit miles just for signing up for an account, and another 500 bonus miles after earning your first 450 Swag Bucks. You can also redeem your Swag Bucks for cash or for gift cards for popular retailers, and get free bonus gift cards as well. Joining the Swag Bucks program is free. Get quadruple Spirit miles through the end of 2015 when you rent from Hertz or Avis. In addition to the bonus miles, you’ll also get up to 35 percent off. This offer is good in the U.S., Canada, Puerto Rico and Mexico. If you like BuzzFeed quizzes, you’ll probably like earning miles for taking surveys through the site Miles for Thoughts. It’s offering 400 Spirit miles for becoming a member and taking your first survey. You’ll earn more miles for every survey you complete while the promotion is active. As an added bonus, doing these surveys keeps your miles from expiring. When you book a hotel through PointsHound.com, you can earn up to 6,000 Spirit miles per night at hotels across the globe. You’ll also get 500 miles for your first booking. You have to act fast, because stays must be booked by July 31, and completed before December 31. This offer is only good for first-time PointsHound users, and can’t be combined with other promotions. PointsHound lets you search, book and earn miles at over 150,000 hotels.